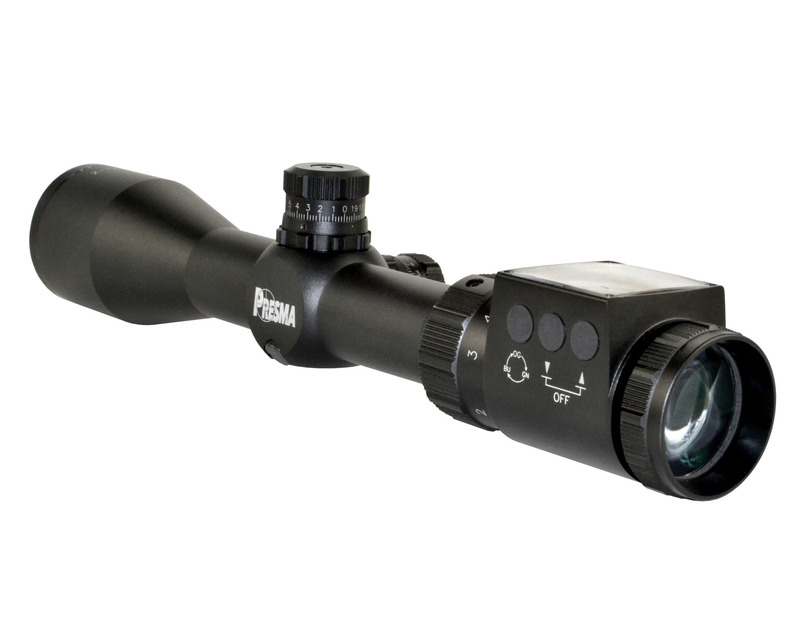 Presma® SP Solar Powered Series 1-6X28 Precision Scope, OGB RXR Glass Reticle. Presma Inc is proud to be amongst the first to offer the shooter...one less thing to worry about. The SP series is a fantastic addition to the Presma product range – a selection of high performance optics for the serious sporting shooter who doesn’t see the need to pay for a big brand name. LIFETIME WARRANTY on all Presma Scopes No more having to carry spare batteries or wondering when the ones you have will fail. Introducing the Presma Solar Powered (SP) range that has three illumination colors, each with 11 brightness levels to choose from. All at the touch of a button! The RXR6 etched glass reticle still performs brilliantly - just without batteries! In addition to this innovative new feature, the SP range offers the same awesome performance you expect from a Presma rifle scope. Solidly built into a CNC-machined one-piece aluminum tube, we’ve included clear glass with fully multi-coated lens throughout. That translates to a crisp target image with maximized light transmission and minimized glare. The 50mm and 56mm scopes all include side focus adjustment – ideally placed for fine-tuning the target picture without having to reach for the objective lens. 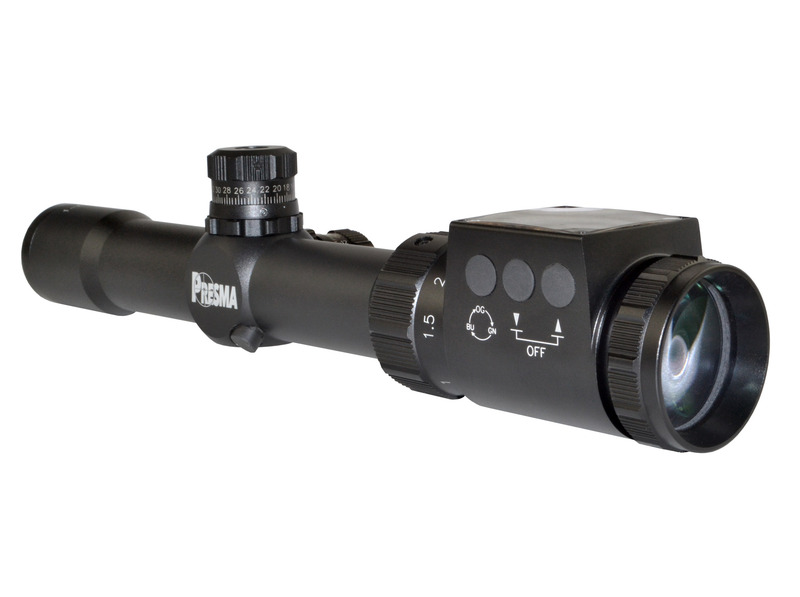 Presma® SP Solar Powered Series 2-12X44 Precision Scope, OGB RXR Glass Reticle. Presma Inc is proud to be amongst the first to offer the shooter...one less thing to worry about. The SP series is a fantastic addition to the Presma product range – a selection of high performance optics for the serious sporting shooter who doesn’t see the need to pay for a big brand name. LIFETIME WARRANTY on all Presma Scopes No more having to carry spare batteries or wondering when the ones you have will fail. Introducing the Presma Solar Powered (SP) range that has three illumination colors, each with 11 brightness levels to choose from. All at the touch of a button! The RXR6 etched glass reticle still performs brilliantly - just without batteries! In addition to this innovative new feature, the SP range offers the same awesome performance you expect from a Presma rifle scope. Solidly built into a CNC-machined one-piece aluminum tube, we’ve included clear glass with fully multi-coated lens throughout. That translates to a crisp target image with maximized light transmission and minimized glare. The 50mm and 56mm scopes all include side focus adjustment – ideally placed for fine-tuning the target picture without having to reach for the objective lens. 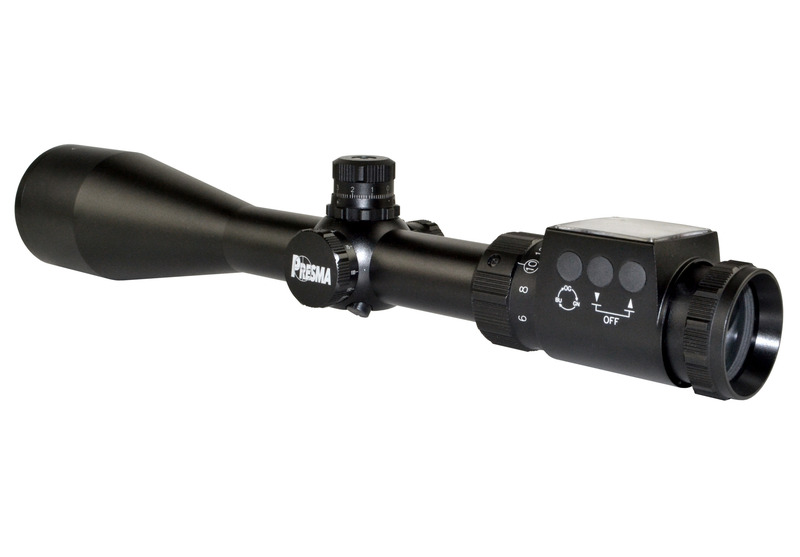 Presma® SP Solar Powered Series 3-18X50 Precision Scope, Side AO, OGB RXR Glass Reticle. Presma Inc is proud to be amongst the first to offer the shooter...one less thing to worry about. The SP series is a fantastic addition to the Presma product range – a selection of high performance optics for the serious sporting shooter who doesn’t see the need to pay for a big brand name. LIFETIME WARRANTY on all Presma Scopes No more having to carry spare batteries or wondering when the ones you have will fail. Introducing the Presma Solar Powered (SP) range that has three illumination colors, each with 11 brightness levels to choose from. All at the touch of a button! The RXR6 etched glass reticle still performs brilliantly - just without batteries! In addition to this innovative new feature, the SP range offers the same awesome performance you expect from a Presma rifle scope. Solidly built into a CNC-machined one-piece aluminum tube, we’ve included clear glass with fully multi-coated lens throughout. That translates to a crisp target image with maximized light transmission and minimized glare. The 50mm and 56mm scopes all include side focus adjustment – ideally placed for fine-tuning the target picture without having to reach for the objective lens. 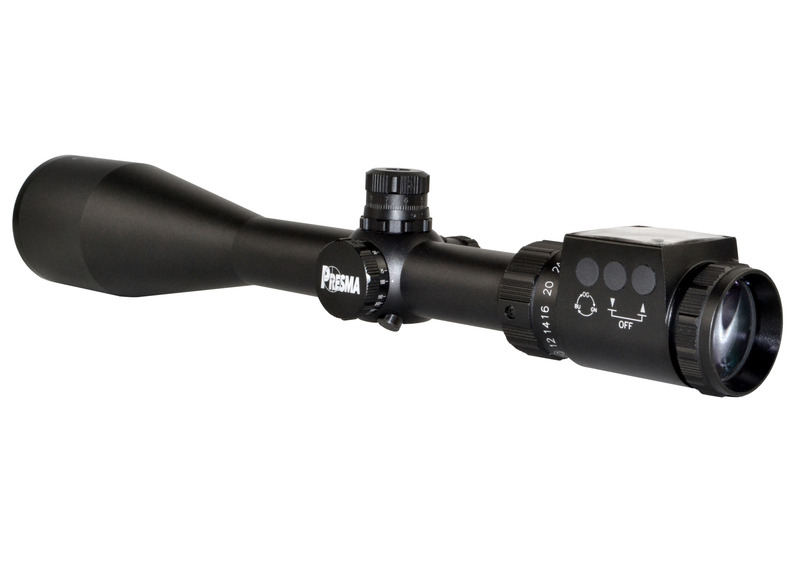 Presma® SP Solar Powered Series 4-24X56 Precision Scope, Side AO, OGB RXR Glass Reticle. Presma Inc is proud to be amongst the first to offer the shooter...one less thing to worry about. The SP series is a fantastic addition to the Presma product range – a selection of high performance optics for the serious sporting shooter who doesn’t see the need to pay for a big brand name. LIFETIME WARRANTY on all Presma Scopes No more having to carry spare batteries or wondering when the ones you have will fail. Introducing the Presma Solar Powered (SP) range that has three illumination colors, each with 11 brightness levels to choose from. All at the touch of a button! The RXR6 etched glass reticle still performs brilliantly - just without batteries! In addition to this innovative new feature, the SP range offers the same awesome performance you expect from a Presma rifle scope. Solidly built into a CNC-machined one-piece aluminum tube, we’ve included clear glass with fully multi-coated lens throughout. That translates to a crisp target image with maximized light transmission and minimized glare. The 50mm and 56mm scopes all include side focus adjustment – ideally placed for fine-tuning the target picture without having to reach for the objective lens. 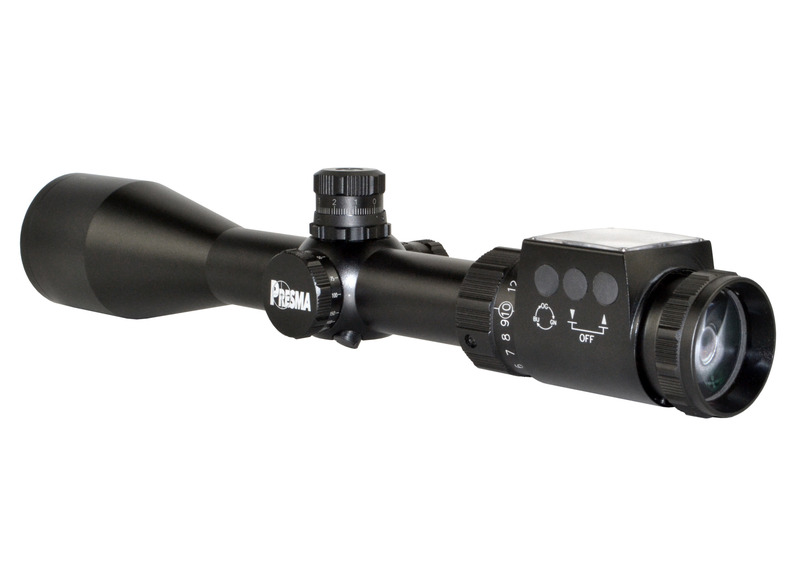 Presma® SP Solar Powered Series 6-36X56 Precision Scope, Side AO, OGB RXR Glass Reticle. Presma Inc is proud to be amongst the first to offer the shooter...one less thing to worry about. The SP series is a fantastic addition to the Presma product range – a selection of high performance optics for the serious sporting shooter who doesn’t see the need to pay for a big brand name. LIFETIME WARRANTY on all Presma Scopes No more having to carry spare batteries or wondering when the ones you have will fail. Introducing the Presma Solar Powered (SP) range that has three illumination colors, each with 11 brightness levels to choose from. All at the touch of a button! The RXR6 etched glass reticle still performs brilliantly - just without batteries! In addition to this innovative new feature, the SP range offers the same awesome performance you expect from a Presma rifle scope. Solidly built into a CNC-machined one-piece aluminum tube, we’ve included clear glass with fully multi-coated lens throughout. That translates to a crisp target image with maximized light transmission and minimized glare. The 50mm and 56mm scopes all include side focus adjustment – ideally placed for fine-tuning the target picture without having to reach for the objective lens.